Simply outstanding are two words one can use to describe Ian Ngatia the promising young swimmer who has taken to the headlines recently. 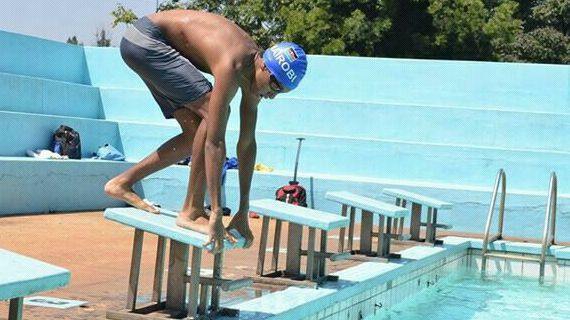 He put himself on the national scene when he won the gold medal and came runners up in a number of other categories in the Level 1 regional swimming championships in South Africa. The story of the talented 16 year old cannot go unnoticed. He took to the pool two years ago and has never looked back. Not only is he good in Music but is also termed by those close to him as refined artist. He has come up with amazing drawings that gets one into full attention. His collection of drawings range from cartoons that can tell a story on their own will evoking different emotions. He started drawing at an early age something that begun out of his love for photos. He now can do imaginary pictures without having to refer to anywhere and hence increasing his creativity. “My drawing has greatly improved in the last couple of years with people saying I express my emotions more through art.” explains the St Mary’s year 11 student. He has the ability to play up to five instruments namely the guitar, piano, drum, xylophone and saxophone. His skill has grown immensely even propelling him into becoming a key member of his church band. Even with all the other talents he has enormous interest in swimming something he wants to turn international after his education. Ian whose speciality is in the freestyle recently tried the backstroke and surprisingly won gold. “I have the best encouraging parents one could wish to have. My mother has always encouraged me to do my best in everything I do. Dad too has always been there for me. They both push me to greater heights.” he adds. His growth has been gradual having started while in primary school and going through swim groups where they were taught the basics. "Unfortunately, as some of our swimmers approach 12 to 13 years, the pressure of achieving qualifying times can prove too big a hurdle and some do not quite hit the grade, and they tend to wane off.” Ian says. Ian wants to work hard to qualify for the CANA swimming Championships slated for October in Egypt and that he has to put extra effort to achieve the goal. In freestyle his best time is 28.64, 35.24 in the breast stroke, and 35.42 in back stroke and 31.42 in Butterfly. He is working towards improving his time. His coach Gerald Atek who also doubles as the St Mary’s coach spoke highly of Ian saying of the swimmers he has seen develop, he will go places. “Discipline is one big factor for swimmers in order to succeed. From the moment I saw the boy two years ago he has grown to be an all round person. With age still on his side I am seeing even greater success in him.” He says. Atek wants the swimmer to be an all round swimmer and participate in all categories before he can finally settle down and specialize in a particular event. The coach has never had a problem with Ian who is always at the pool without miss. Each day by 6.00 am whether it is raining or not he never fails. So how does the swimmer balance all his talents without overlooking studies? He adds the school has been supportive of his talents by even giving him permission to travel out of the country even when exams are going on. On personal time he has trained himself to utilize his time properly by working with a well laid down timetable. “I always know where I am supposed to be at any particular time. I have time for my music, drawing, reading this being my final year in school, entertaining myself and going to church.” He notes while smiling. "My school has produced great personalities the latest being Kenya’s fourth president Uhuru Kenyatta. I feel motivated to have shared same school and facilities with our head of state. I want to be remembered for great things in future." While he cannot talk of the Rio Olympics yet, Ian will not shy off from the challenge of working hard to achieve any target in sight. "I will start with FINA world swimming events later this year and then next year if I can work on my time I will surely make it to the team.” He concludes.